A glorious babel of a novel…marvellously inventive…utterly involving…The next volume cannot come too soon. That may be so, but for me this next volume came too late for me to remember Sea of Poppies, even though I very much enjoyed it at the time. I’m not going to get caught out like this again: fully completed trilogies only for me in the future. The basic conceit of the Ibis Trilogy is a storm in 1838 that catches up three ships: the ‘Ibis’, carrying indentured labourers and convicts to Mauritius; the ‘Anahita’ carrying a cargo of opium to Canton, and the ‘Redruth’ on an expedition to collect rare plants from China to take back to England. Sea of Poppies dealt with the ‘Ibis’; this book takes up the ‘Anahita’ and ‘Redruth’. The structure of River of Smoke reminded me of the advice about paragraph-writing my second-form teacher imparted to me: “an opening sentence that links to the previous paragraph; then- new information; then- a final sentence that sums up where you have been and leads onto the next paragraph”. 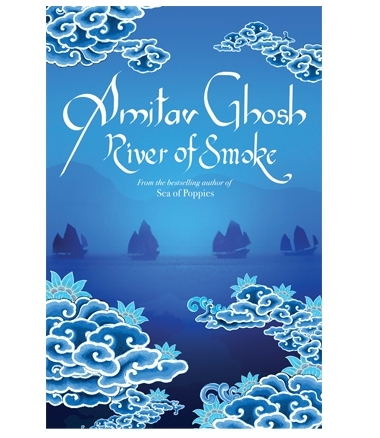 River of Smoke opened by plunging back into the world of the earlier book. Names flashed up at me- did I remember them? Should I remember them? Am I going to understand this book if I can’t remember them? The reader is immersed again in language rich in foreign patois, for which no definition is given- there’s no glossary in this book. I found it an anxiety-provoking way to start and I wonder how someone who had not read the earlier book would cope. However, with the second chapter the book quickly moves onto new material that is only tangentially related to the earlier book, and this middle part is the heart of this story. It is only in the closing pages of the book that it returns again to the opening scenes, and hints at unfinished business that will no doubt be addressed in the final volume. It was confronting for me to remember that this book, set in the late 1830s and early 1840s is exactly the same period that I am studying. Although newspapers provided news from across the Empire, the Colonial Office of that era organized its correspondence strictly by colony (New South Wales; Van Diemen’s Land; Canada) and thus you tend to develop tunnel vision, seeing only ‘your’ colony. The more prestigious Indian civil service and ‘the rest’ (i.e. settler colonies, Africa, West Indies) seemed to operate on two separate tracks, and although it sometimes occurred, it was not common for civil servants to cross from one to the other during the course of their career. Notwithstanding the ultimately ruthless treatment of indigenous people across the empire( which was at least cloaked in humanitarian and philosophical rhetoric), it comes as somewhat of a shock to see the blatant opportunism, cynicism and manipulation of the imperial economy as it operated the opium trade under the mantle of Free Trade. Free Trade was the mantra of the day, and although some readers may think the frequent references to it in this book are overdone, I’ve seen the way that it was used as a fundamental operating principle and philosophy in the primary sources I’ve used too. Just as our own globalized political and economic debate is framed today in the language of ‘the market’ and ‘free enterprise’, so too Free Trade was the mainstream political orthodoxy of the day, and the lens through which all social and economy policy was viewed. One of the two narrative threads of this book centres on Bahram Modi, a Parsi opium trader from Bombay, who needs his large consignment of opium to sell well to entrench his position amongst his in-laws. He is a complex character. He has been living a double life, dividing his time between his traditional marriage in Bombay and his lover and son in Canton. He is painfully aware of his marginal, and ultimately dispensible status between the British agents of the opium trade and the Co-Hong merchants who deal with them. In the opening salvoes of what will culminate in the Opium Wars, a new provincial governor is determined to put a stop to the opium trade, and Bahram is compromised between loyalty to his business contacts and acquiescence in and support for the British-dominated system that he knows exploits and degrades all those who participate in it. The second narrative thread picks up a second manifestation of British imperialism: the trade in flora, fauna and botantical knowledge as the red areas on the map increased and further inroads were made into their interiors. I’ve seen this in my own research too, where to cement and further the relationship with their patrons back home, minor colonial civil servants would package up specimens to send across the world. In this book, it is played out through a one-sided correspondence from Robert Chinnery, a rather dubious and self-important artist to Paulette, the daughter of a French botanist who, barred from China because of her gender, sends him as an emissary to search for a rare plant, known only from a painting. These letters are voiced in the bombastic, jolly-hockey-sticks language of the colonial milieu, overlaid by a campness that crossed the border into parody. I’m not sure that this narrative thread advanced the novel particularly, and I felt somewhat stymied when the book left Bahram’s story to return to these letters. However, it was interesting watching the two storylines converge geographically and chronologically, so that the same events were reported from two different perspectives. This book is exhaustively researched and it has a huge array of characters, many of whom shifted names and loyalties as they traversed the lines of colonial life. To be honest, I found it hard to keep up with them, and yearned for a list of characters along with a glossary of terms, and even a chronology of real-life events? Am I too reliant on such crutches? Maybe, but their absence sells short the huge amount of work and ambitious scope of this trilogy. This book has made it onto the shortlist of the Man Asian Literary Prize of 2011. There’s good reviews among a group of bloggers who are tackling the longlist for this prize here and here. Read because: I enjoyed the first book in the trilogy and because it was a contender for the Man Asian Literary Prize and was more readily available than some of the others.